Scene or slide completion: Adjust variable Section1 to true when user completes Slide 10. Compliance acknowledgement: Adjust variable Agree to True when user clicks Submit button. Let's take a look at a simple example using two buttons. If you're following along, I'm working in TrueFalse_START.story. We have two buttons on the slide, but we only need a single variable to evaluate. This is not necessary, but it's a big help when working with variables. By inserting a reference to the variable, we can verify the variable is working the way we expect it to work. We'll delete the reference at the end of the project, but keep the reference for testing both the variable and the buttons. Go back to the Insert tab this time go to Text > Reference. This brings up your project variables. There's only one variable so it will automatically be selected. Click OK to close the window and insert the variable reference. Let's preview our work. Click F12 or Preview to preview the slide. Nothing much happens, but we can see the variable reference returned a false message. That's the default value we assigned when we created the variable. Next, we'll add some triggers to our buttons. 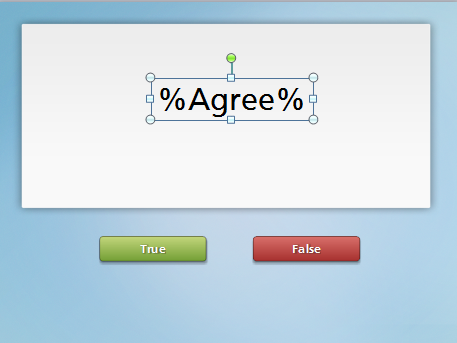 At this point, you've created the True/False variable, but it's not useful until we assign a trigger to evaluate it. Now that our first True trigger is set, we can copy and paste it for the False button. Preview your project and test your buttons.